Rabat We got a good look at alternative strategies to meet the demand of immigrant and domestic workers in Morocco, one from an NGO project with the African Cultural Center of Morocco and the other from a feisty, political union of 18,000 members that had created a “section” for immigrant workers, domestics, and others, like street sellers. Rose Monde and her colleagues were sharp as tacks and very articulate. They had narrowed their focus within the outlines of a European Union grant over recent years to the sub-set of domestic workers who were from sub-Saharan countries, like the Congo, Cameroon, Ivory Coast, and Senegal. Their estimate of the total numbers of domestics in the country and in Rabat, the capital, were huge and in the six figures, but their target was only a couple of thousand. 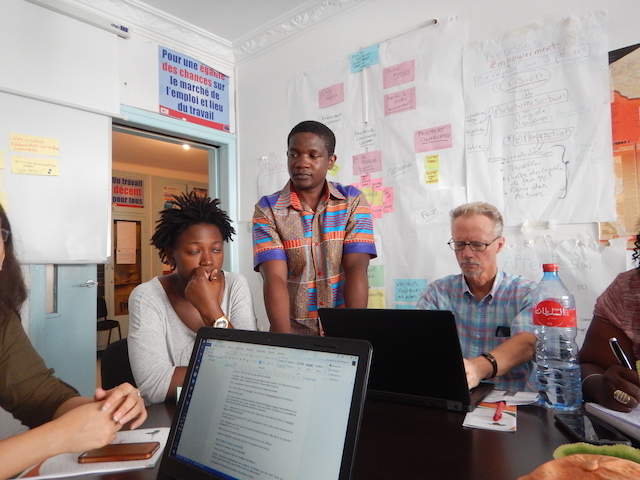 Their main strategy had been education and training in various conferences over the years of the project. The butcher paper on the walls, looked like they had a good understanding of the issues and abuse, but might not have succeeded in forging tactics for effective response. They touted the law that would protect some workers from some of the more extreme abuses, but it still had another year to go before implementation, so it was unclear what their options might be now. 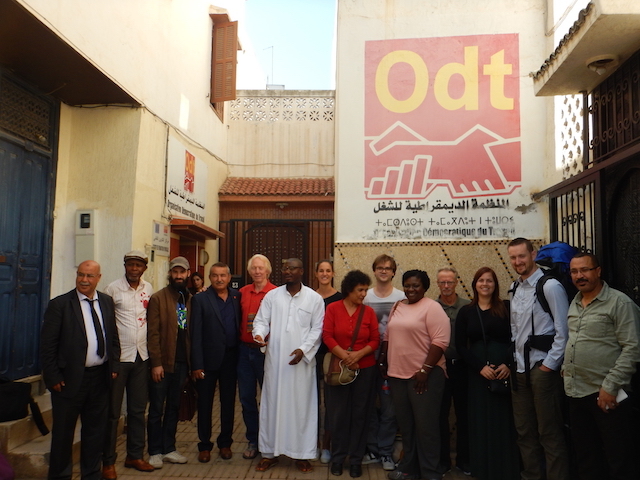 They agreed with the ODT, the Democratic Organization of Workers, and its leadership on several issues, one of them being the fact that Morocco has become less a transition stop for migrant workers moving to Europe, than a destination location now. 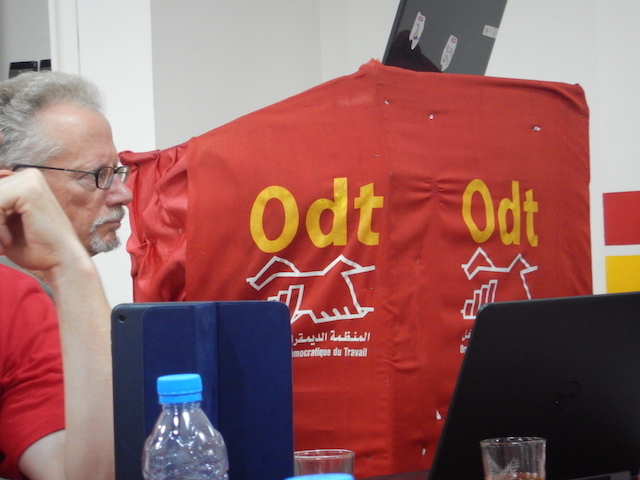 The ODT was a younger union and touted its inclusiveness and openness to various workers. They ran what they called parallel structures with the formal workers and then the various sections of informal and immigrant workers running semi-autonomous programs within them. They were proud of being the first to welcome immigrant workers. The legal framework for immigrants is fraught. The law allows a process of receiving registration that allows the ability to work. In a provision that only President Trump could love, they have to re-register annually and certify that no native Moroccan is interested in the job. If not, all good. If so, away you go! With such a far-flung membership and several offices around the country, the fact that ODT opens its ranks is a smart strategy for growth in the future with limited investment or capacity in the present. 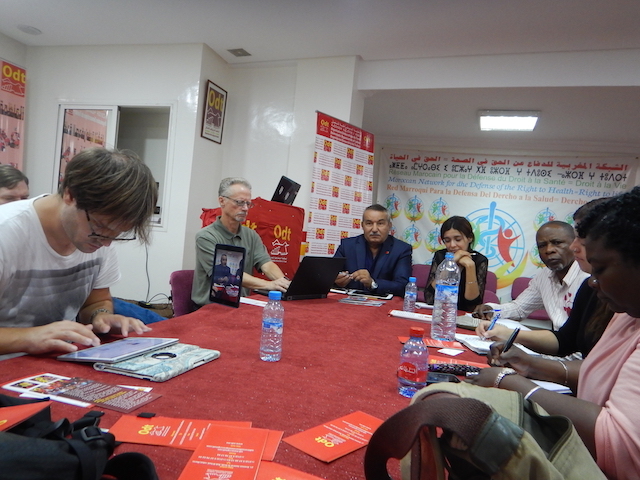 Ali Lotfi, the General Secretary, of the union was proud of his international labor contacts, and mentioned having been at the SEIU convention and heard Hillary Clinton speak. He said they had also helped on the McDonalds’ campaign. The ODT is worth watching. They are doing some interesting work, even if we were sometimes struggling to put our arms around it. The ACM project has some good staff, research, and skills, but lacks some of the innovative instincts and aggressiveness of the ODT. Immigrants and domestic workers with a clear view of their plight are probably wishing there was one plan to build a real organization so that they could win their rights and protect them. Hopefully we’ll hear about that in the next stage. Please enjoy David Bowie’s Suffragette City.